We all know that all life on planet earth is carbon based, that includes plants. The building blocks of all plants is carbon, as well as the bulk of what a they are made of. Carbon dioxide (CO2) is present at a concentration of approximately 350 ppm in the atmosphere. However, this is an average and the actual concentration in a given location can vary. Climatic changes can cause a 4 to 8 percent variation in CO2 concentration daily or seasonally due to increases or decreases in solar radiation, temperature, humidity and the passage of storm fronts. What most people don’t realize is that do not receive their carbon from the root system like most of their nutrients. They actually get their carbon through the leaves and from the atmosphere. The atmosphere is about 3% carbon, so growing outside is not a problem. But carbon can be depleted from the air in the same way nutrients are depleted in the nutrient solution. Plants can deplete the CO2 in a closed greenhouse without adequate fresh air in a matter of hours, significantly reducing growth rates, especially with a large number of plants. Light and temperature will also influence a plants respiration rate and in turn it’s CO2 intake. Exactly how much the light and temperature influences respiration has been reported to be anywhere from no effect at all, to four times more for every 10 degrees rise in temperature. Carbon intake depends on efficient photosynthesis, adequate respiration, and the proper balance between the two. But if the atmosphere surrounding the plants is lacking carbon, the plants wont be able to utilize it to their full potential. Plants enjoying elevated levels of CO2 can be expected to increase fertilizer and water consumption requirements. There are a couple of ways to add CO2 to the atmosphere, and although there are studies on its application in open areas like field crops, that’s quit impractical. Any breeze will just blow all your extra CO2 away. It’s much more practical to use it in enclosed areas like in a greenhouse, especially because a lot of plants in a small area will use up all the CO2 up fast. In a closed greenhouse in winter, or early in the morning before the vents open, plants can use up enough carbon dioxide to slow photosynthesis and reduce growth, so replacing it then is quite beneficial. 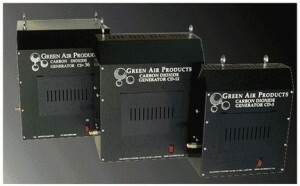 Specially designed CO2 generators are natural gas or propane burners hooked up to sensors. Large commercial growers often use the flue gases from a hot water boilers burning natural gas as a source of CO2. Commercially available CO2 generators offer the most economical, practical and consistent method of enriching indoor gardens. Especially when using them for large greenhouses, and with atmospheric control systems in conjunction with your CO2 generators. This ensures the most effective use of the fuel for applying the right amount of CO2, only when it’s needed. 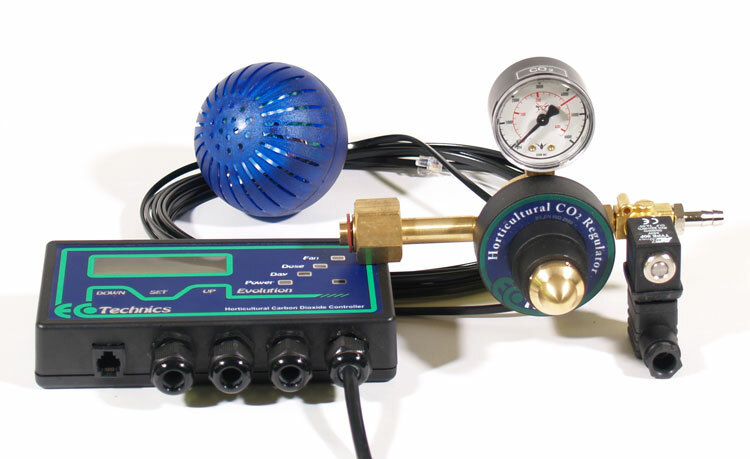 You can also use bottled CO2 which can be obtained from most welding supply houses. It’s even used as carbonation for beverages, so stores that sell equipment to make your own beer may carry it, or at least may be able to let you know where to get it locally. It is important that the CO2 be free of contaminate gases, as some plants like tomatoes are extremely sensitive to many gases, especially ethylene. Bottled CO2 is a less expensive form of CO2 application to start with. It involves the purchasing of the bottle, filling it with CO2, and adding line to run the CO2 out of. You can poke a few holes in the line, and place it in front of a fan to circulate the CO2 into the atmosphere, and manually turning the CO2 on and off. You can also use an atmospheric control system which would be much more efficient (as well as expensive). Atmospheric control systems vary in price and functions. But they are essential in automating the proper CO2 levels of your greenhouse. They can also automate temperature, humidity, lighting, pumps, fans, etc. Control systems for CO2 will have a CO2 sensor, this detects the level of CO2 in the atmosphere in order turn it on and off, and enrich and maintain optimum CO2 levels. Some will even have photo sensor, this allows it to shut off the CO2 outlet during periods of darkness when the plants are not using the CO2. Plants use all of the CO2 around their leaves within a few minutes leaving the air around them CO2 deficient, so air circulation is important. As CO2 is a critical component of growth, plants in environments with inadequate CO2 levels of below 200 ppm will generally cease to grow or produce. Growers should be cautious when experimenting with CO2 levels above 2000 ppm. CO2 is heavier than oxygen and will displace the O2 required by both plants and humans to function and live. OSHA’s maximum allowable levels for human exposure is 5000 PPM. So, air circulation and ventilation is important to a profitable CO2 enrichment system.